The Senate Committee on Public Services on Wednesday started to hear proposals to grant President Rodrigo Duterte emergency powers to solve the worsening traffic problem in Metro Manila and other urban areas. In the House of Representatives, several similar bills had been filed. But while Congress deliberates on possible powers to negotiate contracts and reorganize agencies to ease traffic, the Metro Manila Development Authority continues to grapple not only with actual traffic but obstructions on major roads. 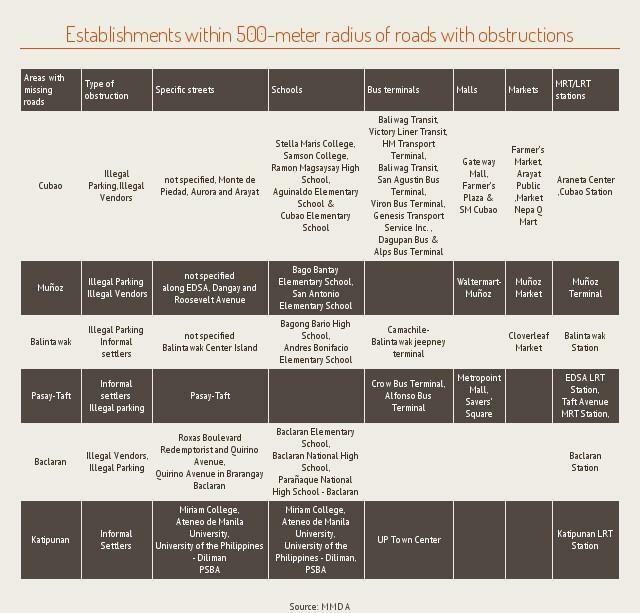 At least six high-traffic areas in Metro Manila have “missing” roads—portions of streets that are no longer open to traffic because of obstructions. The MMDA said these roads are either used as illegal parking areas or occupied by illegal vendors and/or informal settlers. Half of these missing roads are on EDSA—at the corner of Taft Avenue on the boundary of Pasay and Parañaque cities, in Cubao and in Balintawak, both in Quezon City. The rest are in the busy areas of Baclaran in Parañaque City, Muñoz in Quezon City and Katipunan Avenue, also in Quezon City. GMA News Research found that 16 schools, 12 bus terminals, eight railway stations, seven malls and five markets are within 500 meters of these areas. MMDA ‘s Sidewalk Clearing Operations Group said that these places were perennial traffic-prone areas because of these obstructions. The MMDA regularly conducts clearing operations on these roads but the obstructions, especially the ambulant vendors, reappear days after. The missing roads on EDSA aggravate traffic in Metro Manila’s main artery. located—Pasay-Taft, Cubao and Balintawak—are considered transport hubs linking Metro Manila to neighboring provinces. These areas are riddled with bus terminals and railway stations. About 367,000 vehicles ply EDSA daily. About 78 percent of these vehicles are cars. EDSA also has the highest bus volume among major roads, at 14,384 daily. That’s about 43 percent of the 33,000 public buses that ply the major roads in Metro Manila. In a list provided to GMA News Research, the MMDA Sidewalk Clearing Operations Group notes that Cubao is persistently clogged by illegally parked buses, jeepneys or taxi cabs whose drivers are waiting for commuters coming from bus terminals. The MMDA list also notes that illegal vendors are present in these Cubao areas—Monte de Piedad, Aurora Boulevard and Arayat. Being a transport hub, Cubao is dotted by at least nine bus terminals and two train stations. There are at least three malls, two markets and five schools in the area. The MMDA says Pasay-Taft has both illegally parked vehicles and informal settlers. The area is a major link of Southern Tagalog provinces to Metro Manila. There are at least three railway stations, two bus terminals and three malls in the area. Balintawak is a wholesale market for agricultural and livestock produce coming from Central Luzon and Northern Luzon. MMDA included Balintawak in its list of roads for clearing operations because of the illegal parking of jeepneys or buses waiting for passengers, vehicles of market-goers or trucks unloading goods. The center island in the cloverleaf, which links EDSA to NLEX, is also home to informal settlers, the MMDA says. Baclaran is known for being a bargain hub. The MMDA notes the presence of illegal vendors on Redemptorist, Quirino Avenue and Roxas Boulevard, blocking the roads and constricting traffic flow. A railway station and at least three schools are in the area. Streets around Muñoz Market in Quezon City—particularly Dangay, Roosevelt Avenue and EDSA—are also lined with illegal vendors, the MMDA said. Illegally parked jeepneys also lined Muñoz, according to the MMDA. At least one railway station, a public market, a mall and two schools are located in the area. Katipunan Avenue in Quezon City is dotted with informal settlements, particularly in Barangay Escopa and some portions of Barangay Loyola Heights. There are at least four schools, a jeepney terminal, a railway station and a mall in the area. Francis Martinez of the MMDA’s Sidewalk Clearing Operations Group said that while the MMDA conducted clearing operations regularly, illegal vendors always return to the area. “Wala kasi kaming confiscation (ng tinda ng vendors). Yung mga patungan lang nila ang kinukumpiska pero yung mga goods, hindi kami kumukuha. Once nag-operate kami at na-clear namin, nakaalis na kami, babalik na naman ulit sila,” Martinez said. Some 230 MMDA personnel carry out clearing operations. Martinez said that in chokepoints like Balintawak and Baclaran as well as Edsa-Taft and Muñoz, agents of the MMDA were positioned in two shifts. But illegal vendors still find a way to sell their wares, he said. He said the illegal parking situation in Balintawak has been somewhat controlled with the help of the Highway Patrol Group. In the deadliest hours, the streets are clear of traffic enforcers who can help save lives.